Home Unlabelled Is the 'F' Word Holding You Back in Your Classroom? Is the 'F' Word Holding You Back in Your Classroom? "I'm fearful that my students know more about this than I do..."
"I'm afraid to change things up in my classroom, what I'm doing now has always worked..."
"I'm afraid that I will fail in front of my students..."
"I fear that the technology will fail, then my lesson will tank..."
But you know what? Everything turned out alright. I survived. At first I allowed fear to hold me back, but slowly I started chipping away at those fears, taking chances and trying new things in my classroom. It truly was what was best for my students! I often think about how much better some of our classrooms could be if we could just get over the fear of changing, trying something new, teaching a different way than always have. I think the video below serves a powerful lesson for us as educators. Think back to your childhood and a time that you were afraid to do something. Now think of the moment you finally had the courage to conquer that fear. It was exhilarating, wasn't it? It's exactly what you will see as you watch the video. 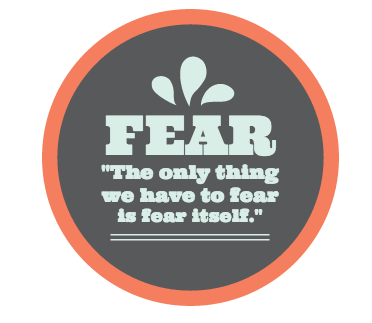 Now imagine some of the great things that would happen in your classroom if you would just quit letting FEAR hold you back. Come on, change it up. Get out of your comfort zones. There are some pretty cool things waiting to happen in your classroom. Great post Craig! I have more struggles with a different four letter word that is just as bad...Lazy! Too often I don't do something I should because it is easier doing what I've always done. I don't know how many times I've heard a teacher say, "I would love to do that but I don't have the time." It reminds me of something Dr. Anita Archer said last year at ALP training last year, "if it help your students learn, then get over yourself!" Great post Craig. That ski jump video brings me tears of joy. I had a teacher candidate say in an interview yesterday, "Failure is a step in learning, not the end of learning." Love that thought.